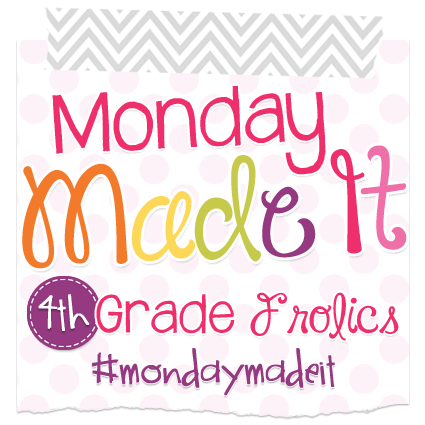 I’m linking up with 4th Grade Frolics! Well, I really wanted to make a super cute welcome back bookmark for my students. 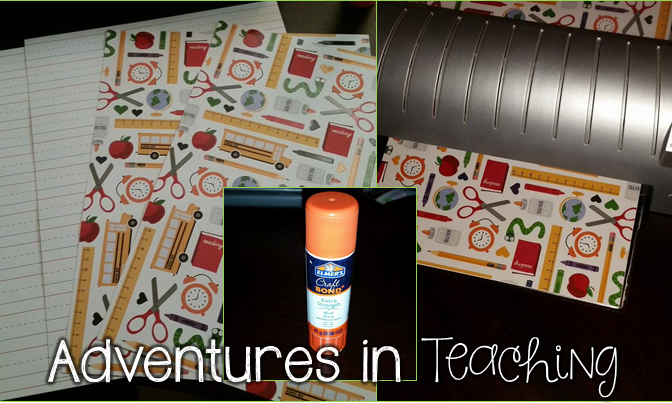 So I hit up trusty ole Pinterest to find an idea. 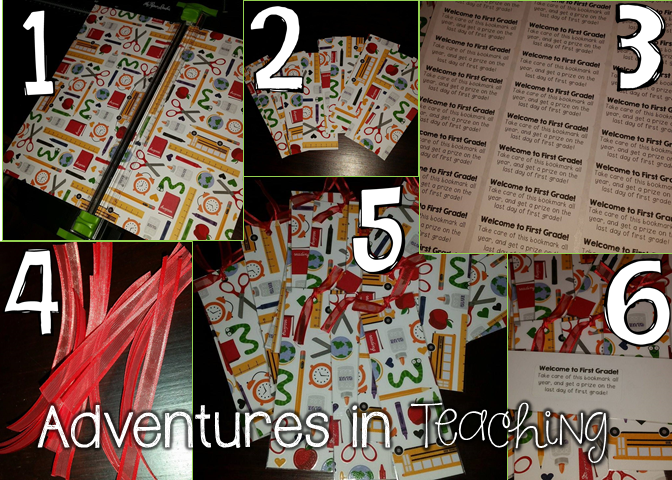 I was then quickly over on Amanda from The Teaching Thief‘s blog because she had an adorable DIY bookmark that I just knew I HAD to try. I went to the store, got my scrapbook paper, bought some craft glue, and set to work gluing the pages together. My laminator warmed up and the glued dried while I ate dinner. Sad face. All my paper was ruined. I even forgot to take a picture because I was so bummed! Back to Joann’s I go to get more scrapbook paper. I really really racked my brain for what I could do instead. I didn’t want a plain white background. Even sweet hubby sat and tried to help me figure out what I could do. Finally, this is what I ended up doing. I cut the 12×12 paper into 2x6in rectangles using my handy-dandy paper cutter. (For someone who can’t cut straight to save their life, this was a MUST). Then, I printed off some labels that say “Welcome to First Grade. 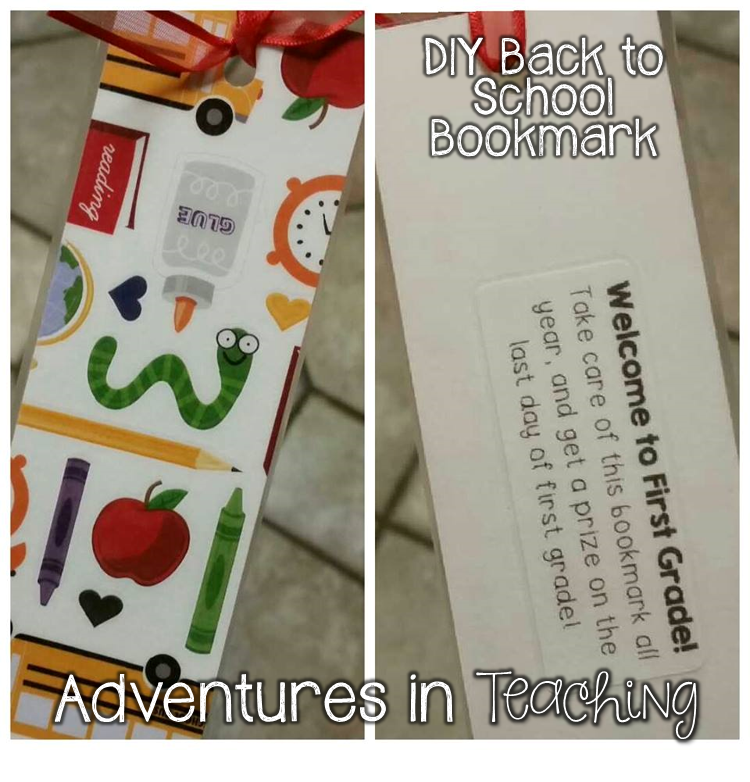 Take care of this bookmark all year and get a prize on the last day of first grade.” I’m not sure how I came up with putting that on the back, but I was thinking about how often my kiddos lose supplies. I really want to encourage kiddos from day 1 to be responsible with their things and I want to reward the ones that are responsible. I laminated the bookmarks, cut them out, hole punched, and put a nice red ribbon on them. Super cute paper. I would forget to reward them at the end of the year, but it is an awesome idea. I use the corners of envelopes as bookmarks for my students. Your bookmarks turned out super cute! Love them. Super cute bookmarks, Cassie! Sorry the first ones didn't work out. That must have been frustrating. But you can't be disappointed with your final product… perfection!